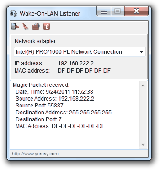 The program receives magic packets and can be used as a Wake-On-LAN configuration troubleshooting tool. It allows to select local network adapters and create Windows Firewall exceptions. Requires administrator rights. . .
Free, compact and handy utility to wake-up (send) PC from (to) Stand-by mode (hibernation or shut-down) at a predefined time. MFC source code is also available for review. Wake-on-LAN Packet sniffer is designed to troubleshoot and setup Wake-on-LAN entire your Network. Power management solution for organizations of any sizes. Tool allows you to manage the power state of the large numbers of workstations by one click. Available actions: wakeup (Wake-On-Lan), shutdown, restart, hibernate, standby, logoff. The program is specifically designed for system administrators. Allows you organize automatic power management for you organizations. Shutdown and wake up the computers of your employees by a schedule. Wake-up On Stand-by or Hibernation is a simple utility that helps you to wake up your system from a Sleep mode (or Hibernation) without wasting so much energy. Wake-up On Stand-by or Hibernation is a simple utility that helps you to Wake up your system from a Sleep mode (or Hibernation) without wasting so much energy. Also you can use this utility as a scheduler to run programs without involving a Sleep mode. Wake Up E-mail Notifier is a new and powerful software that you can get it for free on your computers.